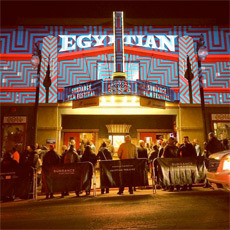 The festival is winding down, people are heading home, it's nearing the end… The 2014 Sundance Film Festival is almost over and even though I'm just departing today, I am already starting to get nostalgic. I love this festival, I love attending festivals, and although I'm very tired, I don't want to leave, I don't want it to end. On top of all the films and all the excitement around independent cinema, it's the people that make my festival experience so amazing, so unforgettable, every year. My friends (old and new), my colleagues, the volunteers, the staff, the publicists, the filmmakers, the locals, I owe them all so much for being the best. But as always, the highlight of #Sundance is seeing films with good friends, getting to know some friends better, and meeting new ones too. Sundance is one of those festivals that puts all of us on the same platform, and reminds all of us that we're all here for the same reason - to see films. And to discuss them. Finally we're all in one place again - my pals from Los Angeles, the people I somehow don't see much of in New York, my writer Ethan from Indiana, the good folks from Austin, acquaintances from all over the world. It's not just these people, but it's all the other attendees: locals from all over Utah, film lovers from all over the world, the volunteers who work for free in the name of cinema, the publicists and filmmakers here to make an impact. I love ending up in chats in theaters, in the lines, on the bus, at restaurants with any of these people. No matter how old, no matter where they come from, they reaffirm that a love for independent and innovative cinema is still very strong. Over the last seven years I've been attending Sundance I've been rooming with various friends. For the first three to four years, I was part of the infamous "blogger condo", where the likes of Neil from Film School Rejects, Peter from SlashFilm, and Chase and Rusty from Gordon and the Whale would also reside. Eight of us crammed into a place that really only slept five, forcing us all to become even better friends, and in the process making us reflect upon ourselves. Yes, we would have fights, yes we would disagree about films, yes someone would eat someone else's food, but in the end we all gave each other hugs when the fest was over. Over the last few years our condo has evolved and changed hands. Now the unofficial "blogger condo" is in the hands of my good friend Jordan Raup of The Film Stage, who joins with roughly seven others (including a few other The Film Stage writers) in a quaint lil' place. This year my roommates were Jordan Hoffman (@jhoffman) and Matt Patches (@misterpatches). It's not the same condo as it once was, but nonetheless a great group of guys that I'm happy to spend time around, encountering them early in the morning, arguing about what we liked or didn't like, and why, late into the night. I wouldn't have it any other way. It wouldn't be Sundance and it wouldn't be this wonderful if I wasn't around so many good people, so many fun friends. Press ticket master + Volunteer of the Year winner Greg in the Press Office, as well as Jason Guerrasio, Emily Lu, Morgan Ressa, Adam Kersh, Jonathan Epstein, Chelsea Christer and Dor Dotson. Thank you, every last one of you, and thank you to anyone else who I might have forgotten or met along the way. All of you are awesome. Now it's time to end another year at Sundance, but I certainly won't forget the films, the time we spent together (even if it was brief), the discussions, the screenings, and everything else that made this film festival so amazing. I'll be back here next year, as always, and I hope all of you will, too.